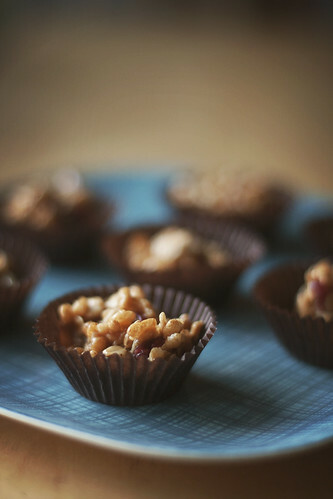 Just in case you were wondering, these Peanut Butter Granola Balls over at Shutterbean are possibly one of the easiest recipes I've made in the past few weeks. The effort to pay off ratio? WAY UP THERE. They were also worth trying to find mini paper cupcake wrappers at three different stores only to find that I already had some at home (note to self: always check your cabinets before going to the store). The recipe Tracy posted is great as is, but I also checked Jeanette's version and added some sunflower seeds to mine and cut back on the oats just a tad. I'm really happy with how they turned out. I may even try chocolate chips next time (oh yes, there will be a next time). These really are the best little snack. I made a bunch on Sunday and have been taking them in my lunch all week. I don't always look forward to eating my homemade lunch, but knowing these granola balls are waiting for me makes it so much easier! \n\n\nJust in case you were wondering, these Peanut Butter Granola Balls over at Shutterbean are possibly one of the easiest recipes I've made in the past few weeks. The effort to pay off ratio? WAY UP THERE. They were also worth trying to find mini paper cupcake wrappers at three different stores only to find that I already had some at home (note to self: always check your cabinets before going to the store). \n\nThe recipe Tracy posted is great as is, but I also checked Jeanette's version and added some sunflower seeds to mine and cut back on the oats just a tad. I'm really happy with how they turned out. I may even try chocolate chips next time (oh yes, there will be a next time).\n\nThese really are the best little snack. I made a bunch on Sunday and have been taking them in my lunch all week. I don't always look forward to eating my homemade lunch, but knowing these granola balls are waiting for me makes it so much easier!